President Mariyana Spyropoulos of the Metropolitan Water Reclamation District of Greater Chicago stated that “Minority businesses received a promising outlook for construction-related contracts with the Metropolitan Water Reclamation District of Greater Chicago (MWRD) at an inaugural conference.” The National Organization of Minority Engineers (NOME) Leadership Summit held at the Gleacher Center last month provided an outlet for minority engineering firms to learn about access, advocacy and participation in a fair procurement process. MWRD, which sponsored the event, also participated in two of the panels. 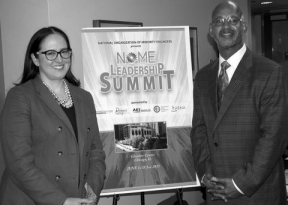 Pictured is President Spyropoulos with Michael Sutton, President of the National Organization of Minority Engineers.